Brilliant new compilation commemorating a decade of top quality pop music from respected California indie label Matinée Recordings. To celebrate the anniversary, the label invited 13 artists to record a new, 45-caliber A-side for its elite ‘Hit Parade’ collection, and the result is nothing less than spectacular! 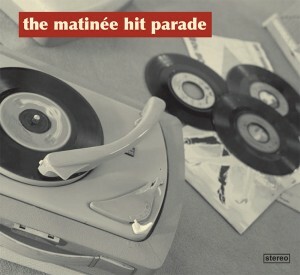 The collection features previously unreleased, exclusive recordings from popular Matinée artists The Guild League (Australia), Harper Lee (England), The Hermit Crabs (Scotland), Lovejoy (England), The Lucksmiths (Australia), Math and Physics Club (USA), The Pines (England), Slipslide (England), and Would-Be-Goods (England) plus Matinée debuts from new label signings Bubblegum Lemonade (Scotland), Clay Hips (Germany/Finland), The Electric Pop Group (Sweden), and Strawberry Whiplash (Scotland). Demonstrating the continuing strength of the label’s roster, this extraordinary collection serves as both an essential new release for devoted followers and a wonderful introduction for label dilettantes. A classic addition to the already esteemed Matinée discography! Label samplers have a tendency to be one thing or another. They are either a wonderful low cost introduction to a label and their eclectic roster of acts you may not be familiar with or a desperate attempt to foist underperforming and unloved acts on to an unsuspecting public. I am delighted to report that Matinée has effortlessly succeeded in being the former. The Matinée label is based in Santa Barbara, California but boast an international signing policy. This disc features diverse acts from The USA, Scotland, England, Australia, Finland, Germany and Sweden. For me the greatest surprise is discovering three new Scottish bands that I had not previously heard of namely The Hermit Crabs, Bubblegum Lemonade & Strawberry Whiplash. The whole feel of this enterprise is like the seminal samplers released by labels such as Creation and Rough Trade at the end of the 80’s. Things kick off with ‘A Little Romance’ from America’s The Math & Physics Club. Straight away the twee-omoter is off the scale. Sounding like Mulligan & O’Hare this falls just the right side of laugh out loud funny. Given what follows I suspect that tongues were firmly planted in cheeks during recording. Next up is ‘Temporary Best Friend’ from England’s Would-be-Goods. All jangly guitars and sharp harmonies this floats along nicely and sounds like the offspring of The Jasmine Minks or Tallulah Gosh. This is followed by ‘Good Light’ from The Lucksmiths (Australia). Their track Good Light is a much more straightforward three minutes of indie Oz style. Sounding like the dearly departed Go-Betweens this is excellent. Four tracks in and it’s Sweden’s turn. The Electric Pop Group treat us to ‘My Only Inspiration’ and I’m taken back to The Sea Urchins, Felt et al. Track five and I’m overcome with a sense of deja-vu (but you knew I’d say that). This time it’s brought on by German/Finish hybrid Clay Hips and Failure. It could be 1984 and any one of a dozen or so Glasgow bands who chose acoustic guitars and sunny vocals. Appropriately enough next up is ‘Tyler’ by Glasgow’s very own Bubblegum Lemonade. A quick look at their webpage describes them as “The Velvets meeting The Monkees in a big funnel” and that’s not too far from the mark. Buzzing along like an off cut from Primal Scream’s Sonic Flower Groove album this is all very lovely and also very 1985. Anyone else remember The Brilliant Corners? Staying in Glasgow The Hermit Crabs are next to try their luck with Sophia. Wispy vocals from Melanie Whittle resonate over yet more jangly guitars and a quiet tambourine. Ms. Whittle’s vocals and the gentle violin make this stand out from the crowd. Rather charming, rather twee and a reminder of simpler times when indie-pop ruled the world. Harper Lee (England) is next to take the floor with ‘Ilene’. Then it’s back to Australia with The Guild League and ‘Call to Prayer’. Maybe it was the vocal and location but I was reminded of Paul Kelly at his quietest and most reflective points. It could equally have been Terry Hall though. This gives way to Strawberry Whiplash and ‘Summershine’. This time dirty guitars roar under the floaty vocals al a Mary Lou Lord. Closing my eyes it feels like 1988 and I can almost smell The Jasmine Minks. The disc is closed out with three offerings from England. ‘Let Things Fall Apart’ from Slipside, ‘Train’ from Wycombe by The Pines and ‘Astronauts’ from Lovejoy. Being of a certain vintage (mid 30’s) this is a truly fantastic nostalgia trip. Whilst I have never previously encountered any of these artists I feel like they are all old friends. There is nothing original or fresh within this collection but this doesn’t make it any less enjoyable. Having listened to the forty five minutes (appropriately enough) of this disc the world seems like a better place. I have also been reminded of all of the reasons I fell in love with the joys of indie pop all those years ago. The wide geographical spread of the artists simply proves that the genre never died it was simply hiding in its bedroom all this time. --Is This Music?